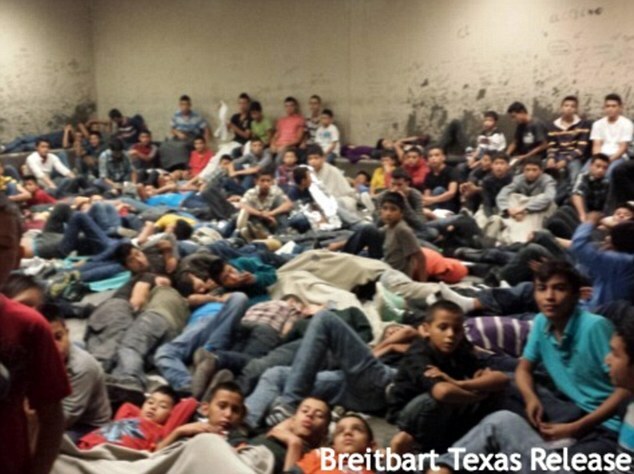 Well look at the conditions in Texas which the Feds IGNORED until the non MSM press started talking about it. Tell me again how illegal immigration is declining. Tell me again how we only have 11 million illegals staying static for over 10 years. It's no wonder, out of desperation. AZ and other states pass the laws they do. From the C-Span segment, once here, the authorities try to find their parents who are in the uS - some illegally. Meanwhile, these kids are housed and fed. I wouldn't do any of that. I think these kids should be put on cargo planes and buses and transported back to their countries of origin daily - no questions asked. The problem has doubled in the past few years and will continue to double until we stop it. Any reason why we cant use the Air Force/National Guard to fly them back? Hmm. Not one comment in here from the defenders of illegal aliens on this topic. I wonder why? Put them on a ship, why r u conserned about geting them home quick ? Because we have zero tolerance and will act immediately. Because time is money. The longer they are in our jurisdiction, the more likely they cost money in food, housing, medical care, possible hospitalization, fake illnesses, you name it. Because consistent daily IMMEDIATE RETURN shipments is a very strong statement - and may (a very unlikely may) motivate the governments of their home countries to take action. They need to be airlifted or bused and offloaded daily - en masse - onto the nearest tarmac or bus station in their home country. We do an immediate turn-around whether authorities are there or not to 'accept' them - and let their home governments deal with them - or not. It is not our concern. Humanitarianism goes only so far. It has now progressed to exploitation. Yes, as long as Obama is letting them all come on in and gets them their free housing, free food stamps, and free medical care, they will continue to come -- more and more every day as word spreads. Because for one, the fact that there are now thousands of children and sometimes mothers carrying infants and toddlers, the open borders crowd really can't claim they're only coming to work hard --- these people know full well we have child labor laws. these children couldn't come here to work even if they wanted to -- but with all the very generous welfare handouts, why would they want to work? The mothers with babies and young children couldn't afford day care costs here, they too aren't coming to work. These illegals are proof that thousands a day are coming for the government handouts. The pro-illegals don't want that fact to be known. Because consistent daily IMMEDIATE RETURN shipments is a very strong statement - and may (a very unlikely may) motivate the governments of their home countries to take action. They need to be airlifted or bused and offloaded daily - en masse - onto the nearest tarmac or bus station in their home country. We do an immediate turn-around whether authorities are there or not to 'accept' them - and let their home governments deal with them - or not. It is notour concern. Humanitarianism is a great way to screw over successful nations..
You reply as I would word for word.